TORONTO, Feb. 21, 2018 /CNW/ - A worry-free retirement may be a thing of the past as Canadians struggle to manage debt. 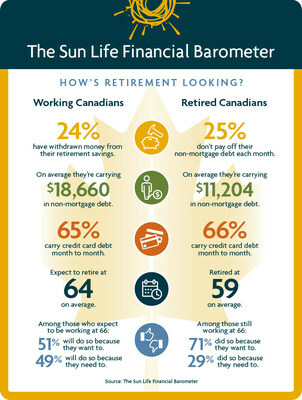 From living with a mortgage to unpaid credit cards, retirees can find themselves facing financial challenges in their golden years.The Sun Life Financial Barometer, a new national survey, found that one-in-four (25%) retirees are facing such challenges and living with debt. 6% haven't paid off home renovations. "Through our national survey, we took a moment to check-in with Canadians and gauge how they are stacking up when it comes to their finances," said Jacques Goulet, President, Sun Life Financial Canada. "From credit card debt to a mortgage, retirees are faced with a list of expenses in life after work. We recognize that managing finances can be overwhelming, particularly for those who are no longer working. Seeking sound advice and working with a financial advisor can help you reach your goals." "Our survey results highlight the importance of getting ready for retirement," explains Tom Reid, Senior Vice-President, Group Retirement Services, Sun Life Financial Canada. "Although it can seem far away, retirement creeps up faster than you think – building a financial plan and making meaningful contributions will pay off in the long run. There are helpful tools and resources you can tap into to get on the right track to building the income you want and need to retire." Don't leave money on the table. If your employer offers a pension plan and will match your contributions, contribute the maximum amount possible. Have a plan and stick to it. It's never too late to build a financial plan that will get you where you want to be. Ready to get started? Find a Sun Life Financial advisor who can support you on your journey to achieve a lifetime of financial security and well-being. Sun Life Financial is a leading international financial services organization providing insurance, wealth and asset management solutions to individual and corporate Clients. Sun Life Financial has operations in a number of markets worldwide, including Canada, the United States, the United Kingdom, Ireland, Hong Kong, the Philippines, Japan, Indonesia, India, China, Australia, Singapore, Vietnam, Malaysia and Bermuda. As of December 31, 2017, Sun Life Financial had total assets under management ("AUM") of $975 billion. For more information please visit www.sunlife.com.